Please note: Due to budget and staffing cuts, the last 100 percent count was April 30, 2015. ODFW is now counting 200 days per year which will give a count accuracy of at least 90 percent. At this time, staff is unsure how often future counts will be posted here. 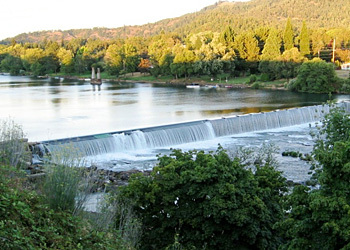 The Oregon Department of Fish and Wildlife maintains a fish counting station at Winchester Dam, located approximately 118 river miles from the Pacific Ocean, near the town of Roseburg on the North Umpqua River. Biologists use the fish counts to monitor populations, make management decisions, and recommend angling regulations. A video camera records fish passage, and a technician views the tapes to record species and size, fin clips, and any predator marks. As the technician also has other fish-related duties, fish counts can be one to two months behind. The Winchester Dam was built in November 1890 and is in the National Register of Historical Places. Constructed from large timber cribs, the dam was originally built 4 feet high and in 1907 the dam was raised to sixteen feet. Winchester Dam provided water and electricity for the town of Roseburg until 1923. In December 1945 a more permanent fish ladder and the first fish counting station on Winchester Dam was built. Two counters working the daylight hours, counted fish that swim over a white board located about four feet below the counter. The ladder was closed when counting was no longer in operation. In 1964, new public and counting windows were constructed in the upper pools of the ladder. These viewing areas were improved again in the 1980’s. Since the fall of 1991 all counts have been conducted from a 24 hour video camera. The primary species of anadromous fish counted at Winchester Dam are summer and winter steelhead, spring chinook salmon, and coho salmon. Small numbers of fall chinook salmon pass Winchester Dam but most fall chinook spawn in the South fork and mainstem Umpqua. Migratory cutthroat trout also pass Winchester Dam in small numbers. The primary non-salmonid species are largescale suckers, pacific lamprey, and northern pike minnow. To visit the Winchester Dam viewing area, take exit 129 from I-5. The site has 65,000 to 80,000 visitors per year. For current fishing reports in this area, please see the Weekly Recreation Report.